What happened to me is either glitch or very bad joke. At the end of 1st season in my career I saved over 6k of resource points and I had a plan to spend them on upgrades. I've never had anything fail as still in first season and have mainly been working to max out the uality control and cost saving stuff befire attacking development more toward end of season. It wouldn't be something to do with the rules changes would it. Ouch! Only had one fail and that was a Chassis part I hadn't done any fail safes on (was just for the trophy failing a part due to a regulation change) so that was on purpose. But I always otherwise purchase all fail and discount parts first, seems to be okay for me. End of 1st season had 1 major and 3 minor parts from all 3 sections and all went through fine. Did you have all quality control parts? 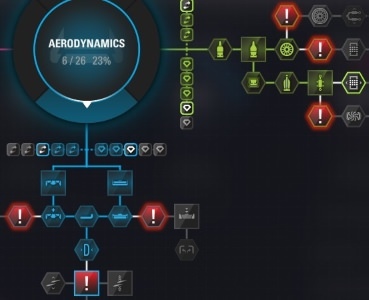 As the rate of failing increases for bigger parts, you'll want to do all before completing any of the biggest R&D. I had the exact same problem last night! I thought about posting it here, but then found out why it didn't work (at least I thought I did). At the end of Season 2 I had 6,300 (!) points saved. I wanted to have three big aero upgrades, one small engine upgrade and two reliability upgrades. I also had bought every quality control upgrade for aero & chassis. When I bought the three aero upgrades, it said there was a 0,00% chance of failure, as it should. HOWEVER those three big aero upgrades still failed. I had saved right after the last race in Abu Dhabi, so I reloaded my save file and tried again. It still didn't work. For season three there were major rules changes in the aero department. I had to re-buy every aero upgrade I had previously bought for 50% of its original value. So I spent my points between Singapore and Austin to make those parts work for season 3. Nothing special so far, this is how the game works. The thing is, when you buy a new upgrade after new rules have been announced, you have to re-buy it in order to be able to use it in the next season. You can only do that once that part has been successfully developed. Since big upgrades take two weekends at least, you can't re-buy it in time for the next season, therefore those upgrades don't comply with next season's rules, you can't use them anymore. At least I hope that that is the explanation for that "glitch", in which case it wouldn't be really a glitch, more like an oversight. I hope they fix that in a future patch. You should be able to re-buy an upgrade immediately to make it comply with the rules for next season, even if that upgrade isn't fully developed yet. So basically for those of us not at the end of our first season yet. Don’t purchase major upgrades after last race is what your saying? Because it won’t be completed in time an therefore can’t pay to upgrade it because it wasn’t completed in time? I tried buying several upgrades (2 engine, 2 aero, 2 chassis) at the end of season 1. Chassis was due for regulation change. Both engine and aero upgrades went through and were OK for Australia, but the chassis upgrades failed so it's possibly meant to be this way. You can buy big ugrades, but only those that are not affected by regulation changes. For example if there are rule changes in the chassis department, don't buy a big chassis upgrade after Abu Dhabi. If you want that upgrade to be ready for the next season, it has to be finished when you arrive in Abu Dhabi and then you need to purchase it again. In that scenario any engine and aero upgrades would work fine if you bought them after Abu Dhabi (small, big and ultimate). At least that's my theory ?